The most advanced personal fitness device. VHOOP is composed of eight pieces which makes it easy to put and take apart. With the limited pieces, you can use VHOOP everywhere at anytime. The whole process should take less than two minutes! 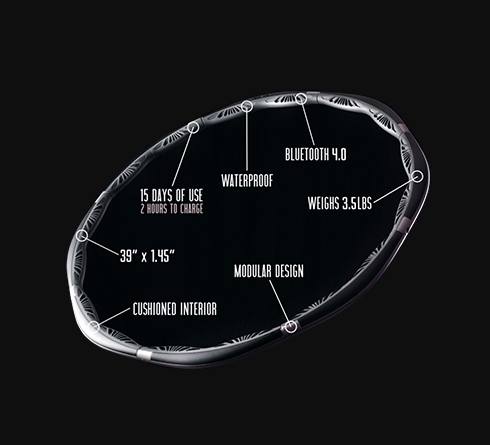 VHOOP comes with 8 additional stainless steel weights. You can add weights in designated ports to challenge yourself from easy to medium hard mode. As more weights are add it strengthens your core muscles which in result in a healthier lifestyle. To lose abdominal fat, calories must be burned. Hooping contributes to overall weight loss, including the extra fat across your core. VHOOP strengthens your core and help get rid of the calories. 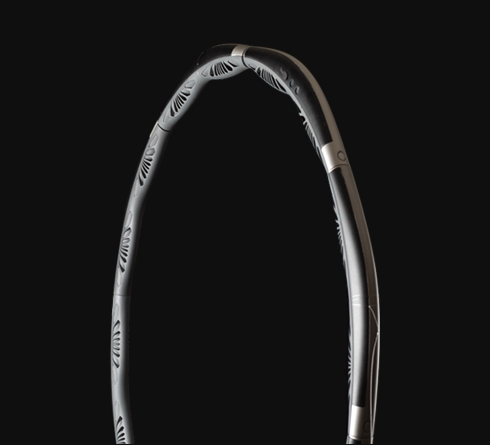 Using VHOOP daily will have fast results on the body you’ve always imagined. 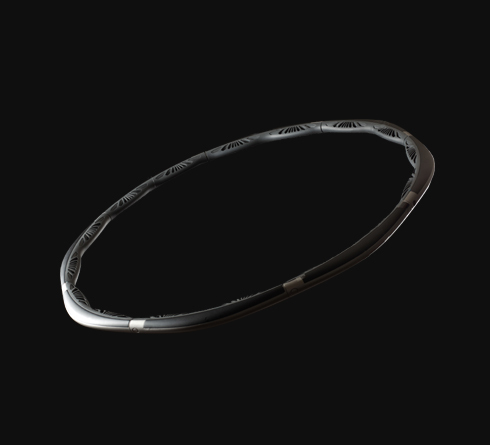 VHOOP is made up of a comfortable silicon foam that is placed throughout the interior of the design. 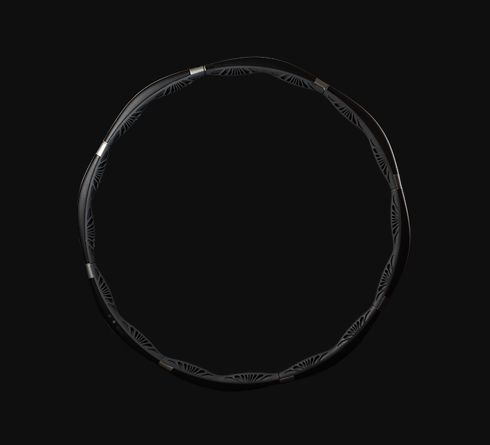 Also, polypropylene is used to make VHOOP durable and waterproof. 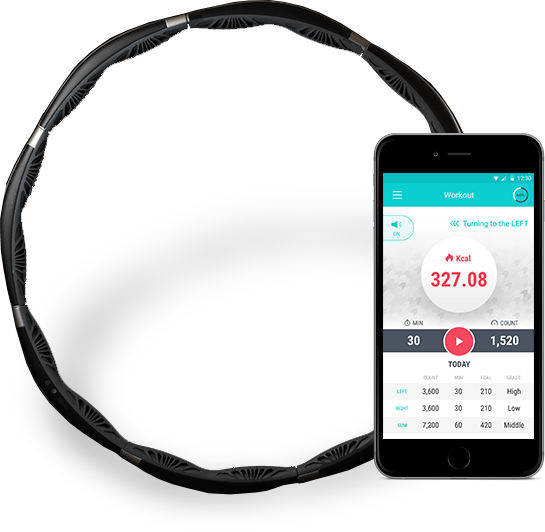 When paired with the VHOOP App it is not just a fitness device but a personal smart gym as well. 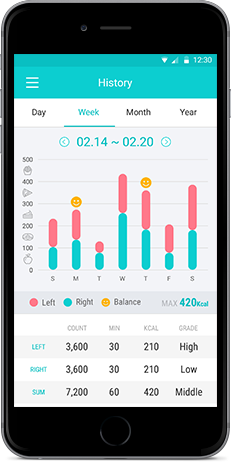 This App will tell you what and how to improve your workout to achieve the highest level of satisfaction. There is no need to pay for a personal trainer when the smart gym is looking over you. When paired to the VHOOP app it’s not only a fitness device but your own private gym as well. You’ll be able to correct your exercise methods and habits though this app. 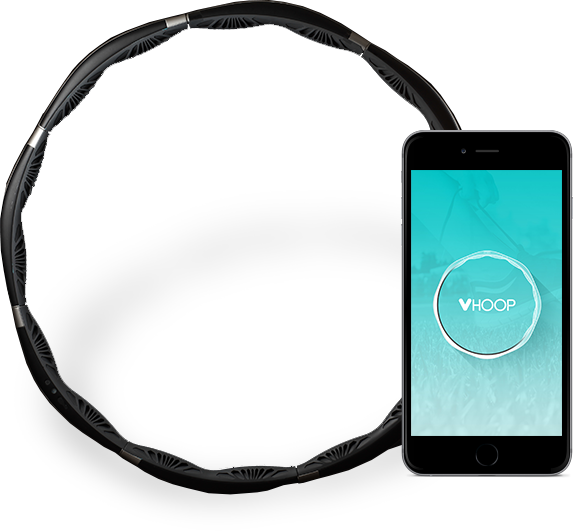 VHOOP uses the workout mechanics of a hula hoop to accurately track the number of turns. The Bluetooth 4.0 transmitter is housed in VHOOP is used to communicate to your smartphone. These sensors can also indicate which side of the body is being used more which can lead to a balanced workout. VHOOP’s battery life is outstanding. 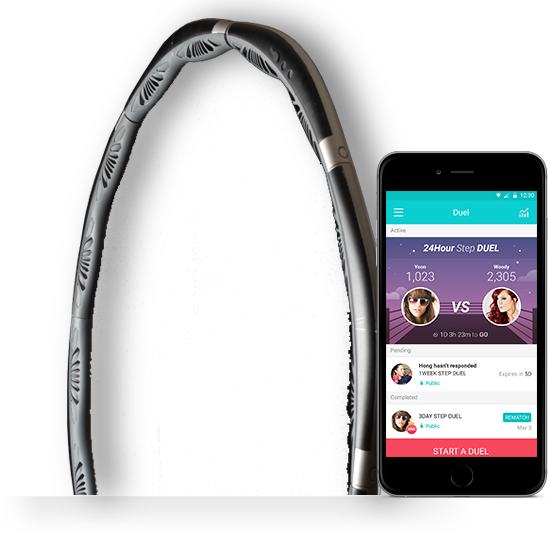 We’ve programmed an auto power saving mode so you can keep hooping even longer! It only takes 1 hour and 30 minutes to completely charge VHOOP which can last up to 15 days. VO2 max is a numerical measurement of your body’s ability to consume oxygen. A higher VO2 max is a good thing: it means that your body can take in more oxygen and deliver it to your muscles, enabling you to run faster for a given effort. ※Specifications subject to change in the manufacturing process. VHOOP knows if you did not exercise that day. The app will send notifications to remind to work out. This will be a constant reminder to reach the goal you have set for yourself. There should be no more excuses in achieving your desired body. 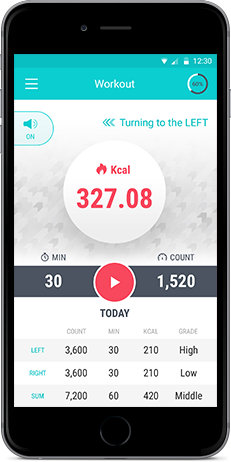 There is no need to guess while you’re working out because with VHOOP App you can view the numeric value behind each workout. 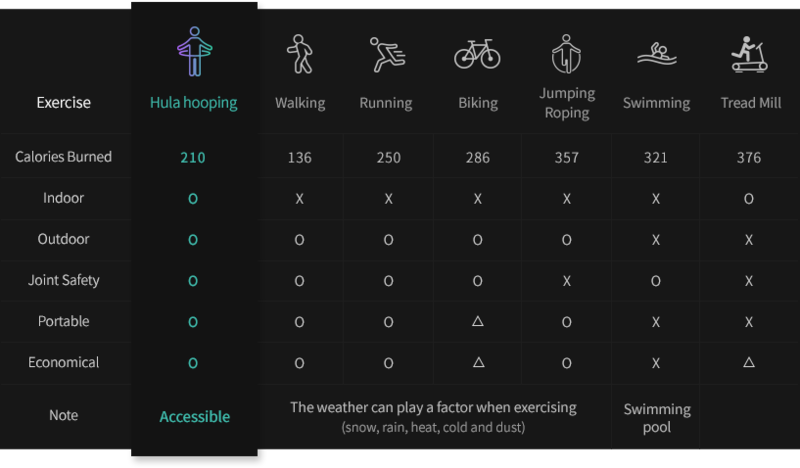 Under the workout section you can see the amount of calories burned, length of the workout, and the number of turns on VHOOP. This tab gives you immediate feedback on how to improve your session and helps you correct it. Just focus on your workout and let the App do all the work. Under the history tab, you can view your past workouts. It will also show you which side of the body was used more and what you can do to achieve a more balanced workout. 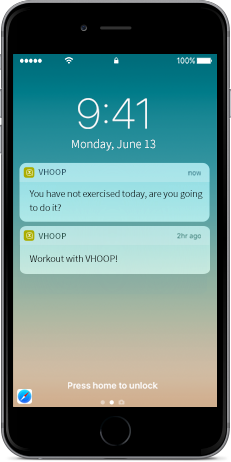 This tab is a great way to keep track of all your workouts and see the progress you have made while using VHOOP. Under the Leaderboard tab, you can view how people around the world and your friends are performing with VHOOP. 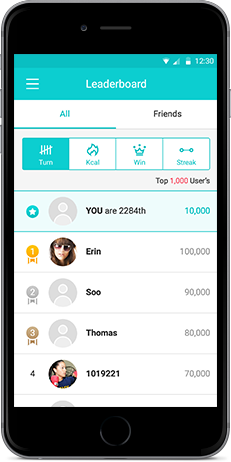 You can view the number of turns, calories burned, wins, and winning streak of the top VHOOP users. Let this be motivation for yourself to reach the top! Unlock awards while using VHOOP. 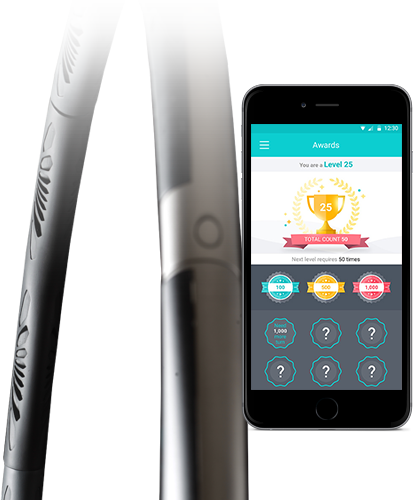 The more workouts done on VHOOP, the more awards you can unlock! You’ll be able to see how far you have come and the progress you’ve made. 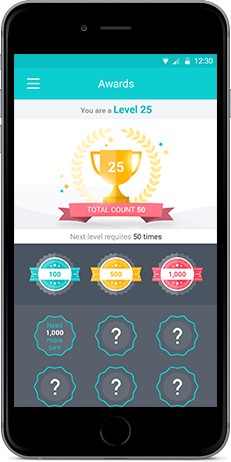 Keep leveling up and share it to your friends. 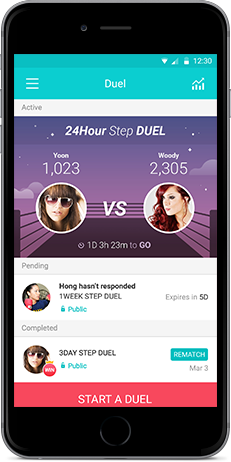 If you want to intensify your workout, you can duel your friends and see who comes up on top. This is a great way for you and your friend to lose those extra calories while keeping it competitive. Build your streak to show others you cannot be beaten. It works well. I feel I can keep it up while changing my speed more easily than other hoops. I have used it for up to 20 minutes, and I felt as though I'd just ran several miles. It's a great work out, especially appreciated since the cold rain keeps me indoors on most days now. I wanted to thank this hoop for introducing me to the wonderful, fabulous world of hoop dance. If you're looking to hoop for fitness and exercise, this is the hoop for you! 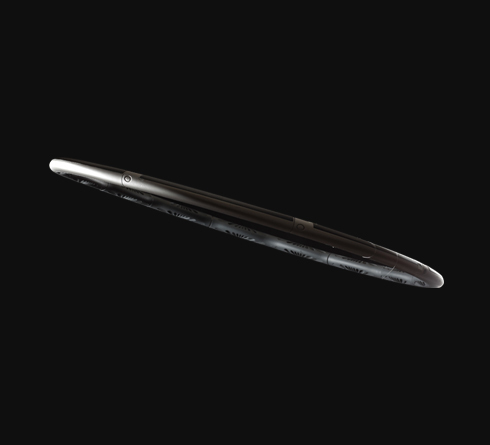 Be the first to find out when our VHOOP launches. It is estimated about 2.1 billion people are obese or overweight worldwide and the number continues to grow. 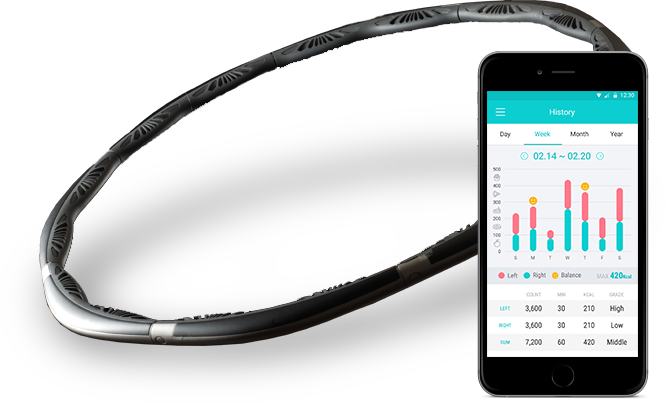 VHOOP may not resolve all overweight problems, however it is designed for those who want to exercise but don’t see the joy or have time for it. VIRFIT is continuously striving to make people happy and healthy through smart exercise equipments and coaching services.